Here are some new screenshots for you! Besides this sneak peek at the early development progress of Enlisted we will also provide answers to some popular questions of our future players. Like and share - and we will endeavour to provide devs’ answers more frequently! Will the houses/fences be destructible? Will bullet penetration depend on material? Usually bullets will go right through light doors or windows. However, they are inefficient against denser items like brick walls. Objects such as doors, frames, crates, and simple wooden fences may also be destroyed by grenades or with an axe. However, concrete structures or houses, are an important part of the map and can only be destroyed by powerful HE shells. At the moment we are still deciding to what extent the degree of detail in the destructible environment will be. At the beginning, we will implement objects that may and will be destroyed most often without changing the maps topology. Will we be able to enter buildings? 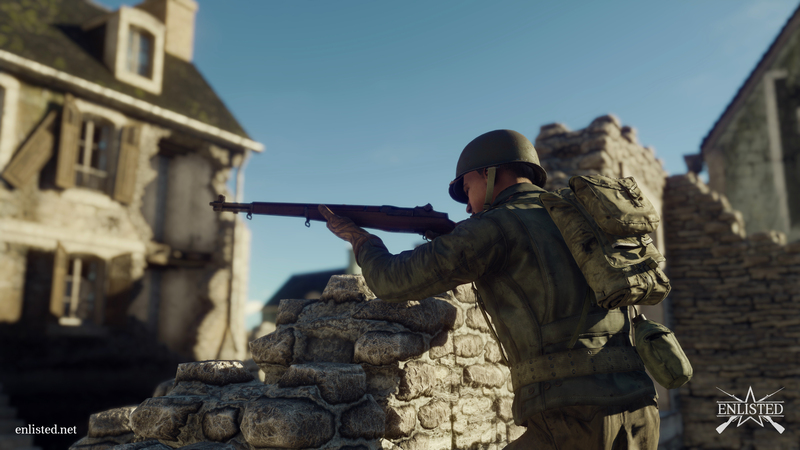 Yes things like houses or bunkers are important part of a map and their interiors are designed so that a player may use them for an ambush, cover, or as a fortification. Will we be able to drive a car or a truck? This feature is already implemented in the current version of the game but in all battle formats, it depends on the map size. Vehicle control is really important on larger locations - in order to relocate a squad, however in close urban environment controllable vehicles won’t fit gameplay as good. Follow the Enlisted pages in Facebook and Twitter to get the latest news! © 2016-2019 Gaijin Network Ltd. All rights reserved. Enlisted is a trademark of Gaijin Network Ltd.